Art Lessons, Ideas, Activities, and Resources for Teaching "Jesus' Birth Through the Eyes of the Shepherds, Angelic Host, and the Stable" in Sunday School. Post your Sunday School ART lessons, ideas, activities, and resources for "Jesus' Birth Through the Eyes of the Shepherds, Angelic Host, and the Stable" here. Please include a scripture reference, supply lists, sources, suggested age range. age modification, etc. Photos are much appreciated! Click "attachments" and upload to your post. Please be careful not to post copyrighted materials. Excerpting and paraphrasing is okay. Include attribution. Manger, Luke 2:8-20, Heavenly Host, Shepherds, Keeping Watch by Night, Glory to God in the Highest. Birth of Jesus, Mary, Joseph, Nativity, Inn, etc. Bible lessons for "Jesus' Birth Through the Eyes of the Shepherds, Angelic Host, and the Stable" -with Art, craft, painting, construction,drawing, etc. Have you ever seen or made a putz? It is a Moravian tradition of creating a scene of the Christmas story. It goes beyond a creche to create a whole landscape that could include a small Bethlehem village and the surrounding countryside. Perhaps you could borrow from this to recreate the countryside of the shepherds. Use your reference books to gather information on the shepherds--their dress, their way of life- and the geography of the Holy Land. The display could be table size, use Playmobil or Lego figures for the shepherds. Find a model train enthusiest in the congregation--s/he would be an expert on building the landscape. Speaking of Lego--you could ask for donations of Lego's from your older youth. Small groups of kids work together to recreate one scene from the story. Watching flocks--angel appears--multitude of angels--shepherds go--shepherds at the manger--shepherds return. Take pictures of each scene, the kids can write captions or use the scripture. each child can take home their own Lego story of the shepherds. There are 3 "bursting in's" in the story. The angels do it to the shepherds, then the shepherds to the holy family, then to others "praising God." So why not make the kids the shepherds and have them do the "bursting" to tell the good news. One FUN way would be to pose a group in front of a large piece of paper, trace their "bursting" pose, then sponge paint bursts of color inside their tracings. Above their heads you could add captions/talk bubbles (write out on separate "talk bubble" sheets just in case someone makes a mistake on the larger sheet). Or, just glue some snowflakes and glitter on paper plates. We used Neil's art project idea with GREAT success! Did this as one of our Advent family rotations using long pieces of white newsprint with red and green sponge painting. Kids came up with some super "bursting with the Good News" comments which parents recorded in speech bubbles. Hung them on the wall in our Fellowship Hall as part of our Christmas brunch celebration decorations (for the Sunday before Christmas). Looks great! This project could easily be adapted for Shepherd's and Angels and Stable motifs. We did a rotation on angels last year and the craft project for that was doing a stencil of an angels and stars on to a pillow case. We used fabric paint and our sewing ladies donated the pillow cases they made out of sheets for this project to keep the cost down. Anyways the children really enjoyed this and my 2 younger boys have them on their pillows right now. My older daughter donated hers (along with some other older children) to a mission. WOW talk about 2 lessons in one, this also made the older children want to do a really good job on the project. Anne CampBoard Member a Supporting Member! An interesting addition might be creating a nativity scene that includes figures in contemporary dress. Throughout history artists have included their contemporaries in the depiction of Jesus' life. What would it look like today? For example, here is a 16th century "Adoration of the Magi in tne Snow" set in a Dutch village by Peter Bruegel. This could be done in a drawing, or with clothes pin figures, with a collage of modern scenes cut from magazines, or lots of other ways. Read the scripture for this lesson. Read and reflect on the overview material provided for this lesson. Spread out the table covers. Write the key Bible verse on the easel. Greet your students warmly, welcoming them to the Art Workshop. Introduce yourself and any other adults. SAY: Today in our Bible story we will hear about how angels and shepherds were messengers, and we’ll talk about the news they shared. First, let’s start with prayer. How many of you have a younger brother or sister? Do you remember when your younger brother or sister was born? Did you tell anyone about the birth of your brother/sister? Did it feel good delivering that good news? Say: Let’s go out to the Bible timeline mural and look at the pictures painted there. Let’s go see if we can see anything about good news. Remind students not to touch the art work. Head towards the Creation portion of the time line. Ask: Where can we find God in these pictures? Say: Recall how I’d said we should come out here to see if we could find any good news. Ask: Isn’t it good news to see that God has been involved in our history since the creation of the earth? Say: It is also very good news that God is still involved in our lives. Ask the students to find what part of the time line shows Jesus’ birth. Head back to the classroom. Say: Let’s read our Bible story. We are looking for who first brought the message of the good news about Jesus’ birth. What are the names of the first four books of the New Testament? Distribute Bibles. Have everyone find Luke 2:1 in the Bible. Ask the students if they can tell you the story. Have them check their Bibles for accuracy. Ask: What did the angel tell the shepherds? Have the students find and read Luke 2:10. Point out that this is part of our key Bible verse. Have everyone repeat this part of the verse with you again. Say: We find our story in the Gospel that was written by Luke. Listen as I read you this story from a Bible story book. Read pages 256 - 265 of the Read with Me Bible. Show the pictures as you read. [In later weeks of the Rotation, have the students tell you the story. Show the pictures to prompt the telling. Say: We have materials here for you each to create a picture of the shepherds and the angels or perhaps you’d rather show the shepherds visiting baby Jesus; it is your choice. Allow the students to choose the material they would like to work with. It may be helpful to have all the students that want to use a certain medium, to sit by one another. Experiment with line width. Create intensely colored lines by pressing hard with the side of the oil pastel. Add thin lines by lightly applying the tip to the surface of the paper. Is possible to apply “layers” of color. Cover a thick layer of pastel with a layer of a second color. Scratch through the surface with a toothpick or craft stick to reveal color beneath. Blend colors using a finger tip or paper towel or Kleenex. Use the tip of the pastel to make a pattern of dots (stipple). Create the effects of shading by filling in areas with stipple dots. Say: The first messenger of the good news about Jesus’ birth was an angel. What do you suppose it would have been like to have angels visit you? Say: The Bible tells us that the shepherds were full of joy with their good news. Listen… Read them Luke 2:20. How has the news of Jesus’ birth had an effect on you? Who is the “angel” who first told you about Jesus? To whom would you like to tell this story of good news? Have students re-tell the story using a set of the story cards. Combine two sets of cards, mix them up and play a game of Concentration. Say: On the very first Christmas God gave us Jesus; Jesus is God’s gift to us. Say: God loves each one of us and wants to have a close relationship with each one of us. In order to help us have this relationship, God sent Jesus. Say: Ordinary shepherds doing their work of taking care of sheep heard those words. Crane, Amy. “Christmas through the Eyes of the Shepherds.” 2001. Read With Me Bible. Grand Rapids, MI: Zondervan, 1993. Copyright 2007 First United Methodist Church, Ann Arbor, MI. A representative of Rotation.org reformatted this post to improve readability. Uses paper mache cones to make characters to recreate the pasture scene. To find the story of the shepherds and the angels in the Bible. To use imagination and creativity to recreate the pasture scene with the shepherds, angels, and sheep. Sequins, buttons, empty spools, etc. Greet the children and introduce yourself and any helpers that you have. · Said, "Do not be afraid"
· Said, "Glory to God in the highest heaven, and on earth peace among those whom God favors." Ask the children if they know anything else (from the story) about angels. Divide the class into three groups. Explain to them that they will be recreating the pasture scene. The scene will require three main sets of characters. Shepherds, angels, and (of course) sheep. Each group will decorate pre-made paper maché cones (the teacher will need to have these made in advance in order to ensure they are dry for Sunday morning. Think about different shapes and sizes for the different characters) to create the appropriate characters for the story (ask each group to chose one character to begin with, adding another if time allows). Encourage creativity. Use Styrofoam balls for heads, sequins, buttons, & yarn for eyes, nose and mouth, fabric for robes and wings, hangers for arms and (sheep) legs, and cotton balls and yarn for sheep hair. Allow 5-10 minutes for clean up. Display finished angels, shepherds and sheep in a public place during this Christmas rotation. Use plastic pop bottles as the bodies, adding a styrofoam ball for the head. Varying the sizes of bottles will add variety to the pastoral scene for this lesson set. The plastic bottles get weighted down with rice in them. Cone shapes can be easily made from poster board or even try something like transparencies that will hold up better and both ideas are less work than paper mache. I have done the poster board ones and I remember I had to cut them slightly curved on the base and then they were stapled. Jubilee FellowshipRotation.org Legend (500+ pts) a Supporting Member! That time line is AWESOME! We have created six banners (which represent the six parts of scripture) due to not being given permission to paint the walls (yet). Our's were also done by a professional artist and are pretty amazing but i like yours as well! made at the church bazaar activity center where time is more forgiving than Sunday morning and the adults like to make one, too, so there's lots of help -- is a tongue depressor and clothes pin craft of the Nativity scene. We also had a treasured dad who pre-cut the clothes pins to the proper size. I love the rustic look of this. Somehow it's more authentic as a craft. But the ONLY work to be done here is hot glue -- which I don't like using with children without lots of adult supervision. The angel's wings and lamb's legs are the ends of clothes pins. This craft uses both flat and round clothes pins. The 3rd photo shows the inside of the base where a whole flat clothes pin is used to stabilize the whole thing. It works wonderfully well. Last thought -- this sits on a table, rather than hanging on the tree. I like spreading the ornaments around! I like it too, Anne. Something "rustic" about clothespins. Glue always seems to be a problem due to time constraints and use by kids. Also don't like the fact that cheap glue dries out and projects fall apart. We will be making snowglobes as part of our Shepherds and Angels rotation this year, getting the kids to dress up as either angels or shepherds and then taking photos of them posing in front of a dark backdrop (blue or black sheet) with some fairy lights as the stars at the top. They will be dressed in the nativity costumes we already have. The photos will be laminated and then placed into jars with grated PVC pipe (for the snow) and a bit of glycerin so the snow falls gently when the jar is shaken. There are instructions on the internet if you want to see photos or step by step, just google "DIY photo snowglobe" and you will have heaps to choose from. Here's a screenshot of the 3-part ornament project created by the Writing Team for its "Jesus is Born" Art Workshop lesson. Rather than glue guns, the project uses gold bead wire to quickly assemble the project with no drying time. Full instructions with lesson wrapped around it in the Team's "Jesus is Born!" Art Lesson. Includes explanation of what the beads represent in the Luke story. 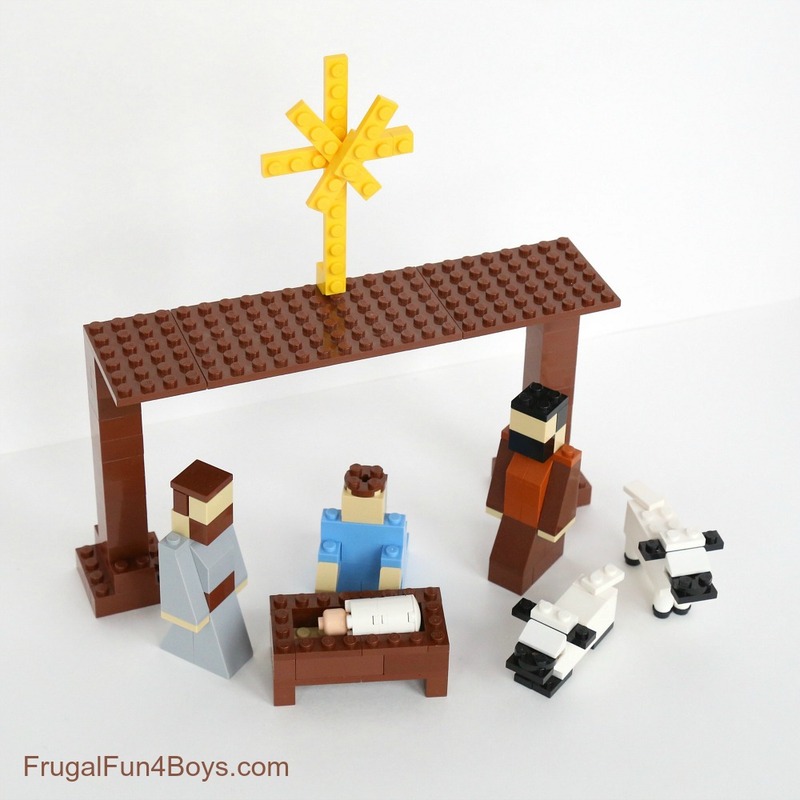 Check out this website to see how to build the nativity. Our Advent forums are ever-expanding with great lesson ideas and resources. In addition to our ever-growing public collection of Advent lesson ideas, be sure to visit our Writing Team's Advent lesson sets. They're extra-creative, extra-detailed, peer-reviewed, and age-adaptable. 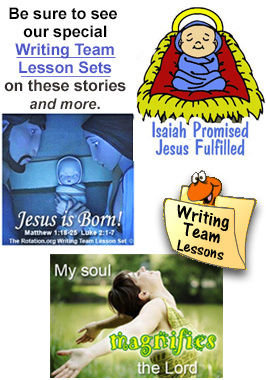 The Writing Team's "Jesus is Born" lesson set is open to all as a gift to all our members and guests. Most "Writing Team" Advent lesson sets are only open to our Supporting Members (join now). Everyone can view Team's Advent Lesson Summaries and Bible Backgrounds. Rotation.org is a non-profit, member supported, ecumenical resource ministry. We're glad you're here. Learn more about us. Just for fun, Registered and Supporting Member are awarded "activity points" and titles for things like posting, replying, bookmarking, and becoming a Supporter.